In most schools and businesses, maintenance of “the” public calendar is one person’s job. That person becomes a bottleneck. When you recognize that logically there isn’t one public calendar, but instead several or many, each with its own appropriate maintainer, then you can break that bottleneck. 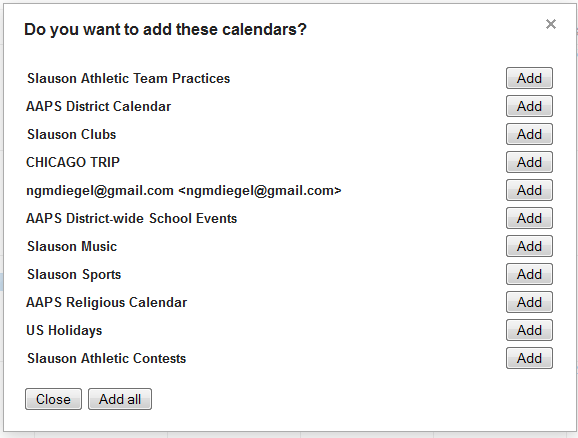 A parent who subscribes to a single undifferentiated school calendar may be overwhelmed by the flow. Parents of kids who are in music programs, or on sports teams, or who are going on the Chicago trip, should be able to focus on those activities. Slauson’s publication of a set of self-categorized machine-readable calendar feeds enables it to represent its sports activities on a city-wide timeline that includes, in this particular view, events from the Ann Arbor Triathlon Club, the Wolverines basketball teams, and Ann Arbor’s kickball Meetup group. Well done Slauson! And kudos to all the Ann Arbor public schools. You have become web thinkers. I hope schools everywhere will learn from your example. Author Jon UdellPosted on 9 Nov 2011 18 Jul 2014 Categories . your last listing also says middle schools – should be high schools. carpetbomberz reblogged this on Carpet Bomberz Inc. and commented: Always nice to get an update on the elmcity project from Jon Udell. It is the ‘calendar’ of calendars and a great project showing how one can leverage open data, but at the same time confront some technological challenges too. Previous Previous post: Long live Harry Tuttle!